German auto supplier Bosch is developing smart-city technology that connects vehicles with infrastructure to provide safety alerts. 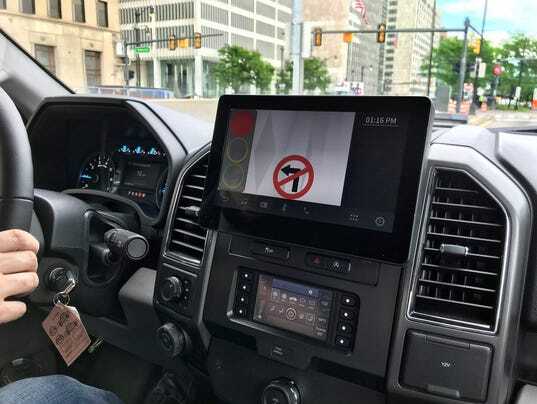 Robert Bosch GmbH demonstrated the system at the intersection of Jefferson and Griswold in Detroit on Tuesday as part of the Intelligent Transportation Society of America's annual meeting at Cobo Center. A camera installed at the intersection monitored a section of sidewalk and the crosswalk at the intersection, waiting for pedestrians, bicyclists, even animals to enter the monitored area and warn the approaching F-150 equipped with Bosch's V2X "box." V2X is the industry term for "vehicle to everything" communication technology, a next step in automotive safety systems in which a car can communicate with everything from infrastructure to the smart phone in a pedestrian's pocket. Bosch's V2X technology "listens" while the advanced driver-assist system "watches," said Philip Ventimiglia, a Bosch product manager. The V2X "box," as Ventimiglia calls it, is equipped with Dedicated Short Range Communications, or DSRC. It's essentially a one-way communication system that listens to signals being transmitted by sensors and cameras installed in surrounding infrastructure. "The advantage of V2X technology is the vehicle can hear things farther away and it can hear things when the vehicle doesn't have the line of sight," he said. "When it comes to the vehicle cameras and radars, if there's an object in their way, then they can't offer that information to the driver. The important advantage here is when the infrastructure is in the game, it can typically see around those other trucks and cars and still communicate that information that's important to the driver." The V2X DSRC system then works in line with an ADAS or autonomous system to best map out the vehicle's path. When a Bosch employee wandered into the view of the camera, mounted on a traffic light pole above Jefferson Avenue, a signal appeared on the F-150's infotainment system. The infotainment system also displayed traffic lights ahead and directional signs like a no-left-turn sign along Jefferson. The camera mounted at Jefferson was built by the supplier's Building Technology division, which develops security cameras and systems for buildings. It's already used in some roadway infrastructure cases, like traffic monitoring on highways. But the camera at Jefferson and Griswold this week takes that traffic monitoring a step further. The system can detect and classify objects to alert the driver to potential hazards. Bosch's cross-industry divisions are working together to put the supplier at the center of the movement into "smart cities," urban areas that will be able to support autonomous vehicles. "Bosch is going cross-domain, cross-divisional to learn from different divisions and take those technologies and bring them into or augment and improve technologies that are already existing," said Frank Sgambati, Bosch's director of business development for smart cities in North America. "We're working with cities, municipalities and departments of transportation to be able to take the existing infrastructure to improve and offer more smart and intelligent solutions." Sgambati worked with the Michigan Department of Transportation to get the camera at Jefferson and Griswold installed for this week's demo. It's a relationship he said he'd like to build upon, though wouldn't say whether Bosch is working with MDOT or Detroit on smart city applications. His division of Bosch is working with "several cities" on these tech applications, he said, including a smart mobility corridor in Columbus, Ohio, and a smart community in San Francisco.